I had an amazing time cooking and discussing healthy eating with consumers at the Springfield Food Day Celebration this past weekend. There was an estimated 1,600 foodies that showed up to take part in the food, music, education and games and the weather was perfect- sunny and warm! It’s always refreshing to see young parents out with their kids at events such as this, and that was the case on Saturday. Thanks to all that attended the event and came by to say, “We follow you on Facebook and love the recipes.” Or, “Your blog is my go-to place for local farm recipes.” THANK YOU! 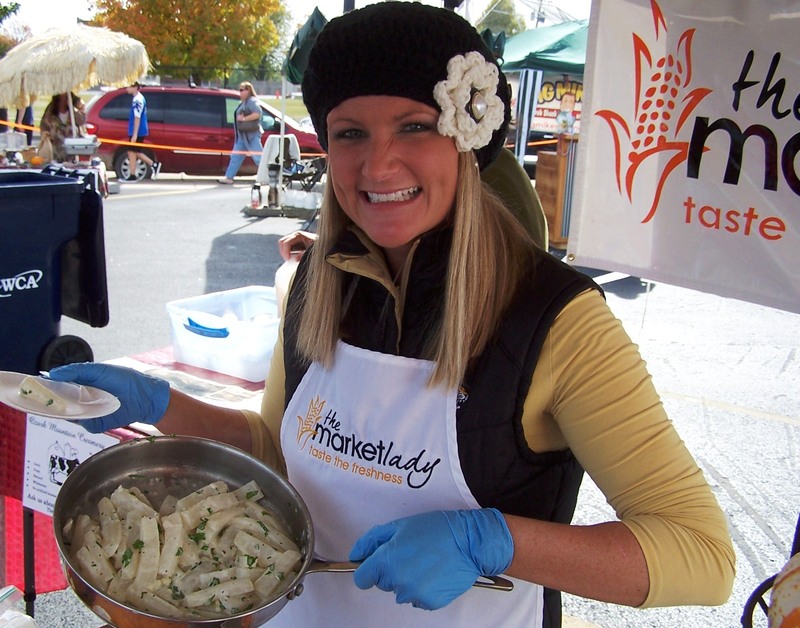 And, if you haven’t had the opportunity to tell a friend about The Market Lady, I encourage you to do so today. It’s as simple as going to our Facebook page and clicking the “like” tab. Be sure and leave a comment on the page too! Nothing spells summer like fruit. And if there is one fruit that symbolize the heat of the summer- it’s peaches. There are two major types of peaches: “Freestone” and “Clingstone”. Freestone peaches have flesh that slips easily away from the pit. With Clingstones the fruit clings to the pit! How to tell if the peaches are ripe? One thing to keep in mind is that once a peach is picked from the tree the fruit will not ripen any further, they only soften. Softness: unless you like your peaches very firm, pick your peaches with just a little “give” when gently pressed. Peaches at this stage are great for eating, freezing and baking. I’ve picked up some peaches here at the market from a local orchard that are perfectly ripe. I’m going to be grilling peaches today- one of my family’s favorite ways to enjoy in the taste of the summer. 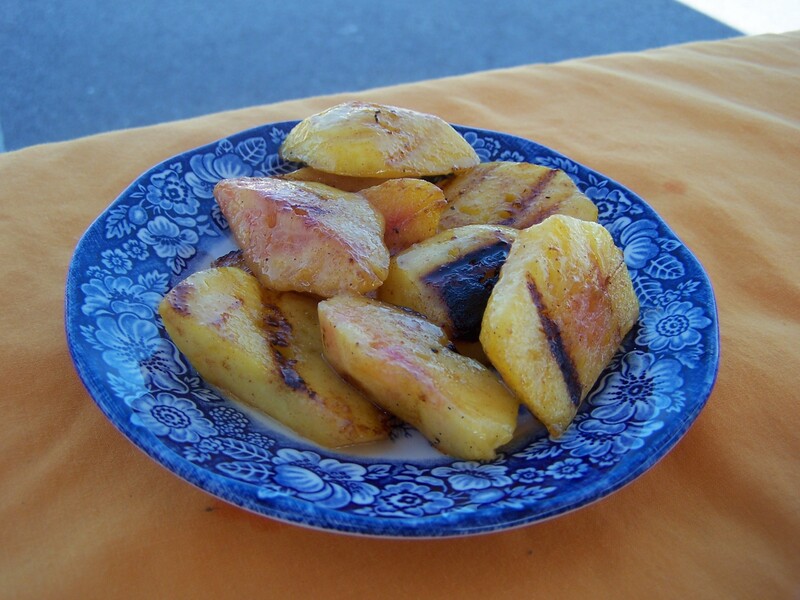 I grilled up peaches from Ozark Mtn. Orchard in Highlandville, Mo., today at the Christian County Farmers Market and consumers raved about this simple dessert. My family loves to throw some peaches on the grill while the coals are still hot, plate the peaches and then top with vanilla bean ice cream. Slice peaches in halve and coat with melted butter and sprinkle with cinnamon. OPTIONAL- sprinkle with sugar. Grill until soft, about 3 minutes per side. Top with ice cream. When you come home from the market with a peck of peaches try spreading the peaches on towels and separate any damaged fruit immediately. Put a couple of days supply into the fridge, wash and cut the others and freeze them up to savor the peach season. 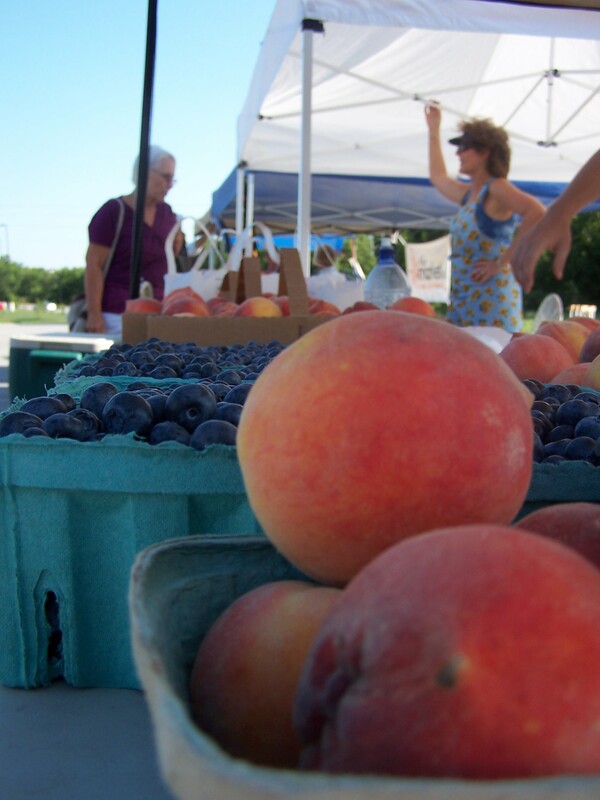 Head on out to the market today and enjoy the sweetness of the season.